Is a member of one of the best-known yachting families, the Bridsons of Bolton, Lancashire. He was born in 1860, his father being Mr. Harry Bridson, a celebrated yachtsman of his time, and during forty years owned twelve yachts, in­cluding the schooner Iolanthe, 83 tons, which he designed himself, and the celebrated Dan Hatcher boat Muriel, 40-tonner. Muriel was successfully raced by Jim Thompson, who skippered her, and secured £1,200 in two years, including two Albert Cups and the Royal Ulster Cup (twice). Mr. Harry Bridson was one of the founders of the Yacht Racing Association, and was elected Vice-President at its formation. Mr. Andrew Bridson was educated at Eton, and long before his school­days were ended he exhibited a passion for yachting, owning quite a large fleet of model yachts. At fourteen he became a recognised yacht-owner with the 3-ton cutter Rover, and later the 5-ton cutter Wren. These boats he raced when and wherever possible, and in 1877 he joined the Royal Dart Yacht Club. From 1879 – when he was elected to the membership of the Royal Thames Yacht Club, an election which, owing to living inland, he did not take up – to 1887 he was compelled to forsake the sport, but in the latter year he returned to cruising, owning successively Zotiss (a 3-ton steam launch), Beaver (7 tons), and Chita (22 tons). He assisted in founding the Start Bay Yacht Club, Dartmouth, hold­ing the office of Rear-Commodore, and did much legislative and organizing work in con­nection with the Dart Boat-Sailing Club as Commodore, the Dartmouth Port Regatta as Chairman, and the Yacht Racing Association, of which he was then a member. He also initiated the West of England Sailing Con­ference, and was President and Hon. Secretary for several years. Clubs: Royal Cruising, Dart Sailing, and Saltash Sailing. 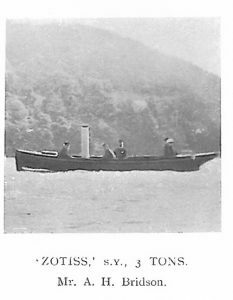 Zotiss, S. Y., 3 tons. 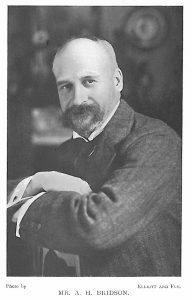 Mr. A. H. Bridson.